Alderman Robert Puente represents Milwaukee’s ninth district and previously served in the Milwaukee Police Department for 27 years. Back to the full file. 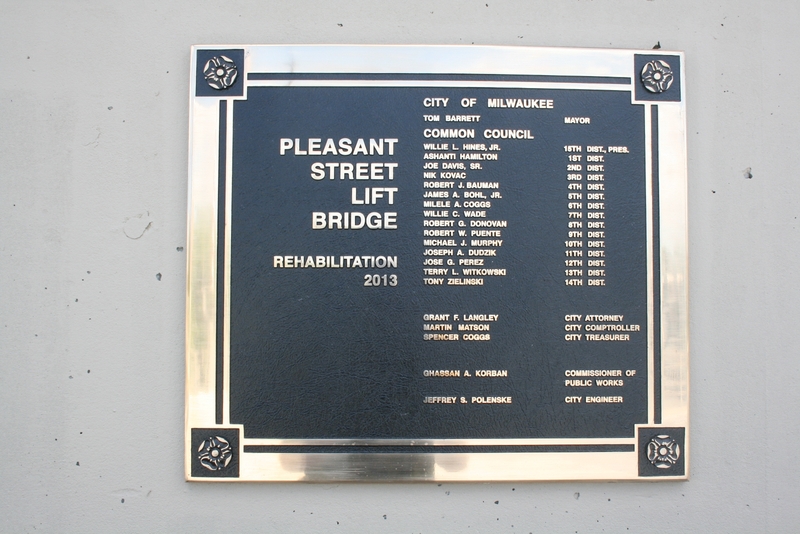 The recently unveiled Pleasant Street Lift Bridge plaque. Listed parties include Tom Barrett, Willie Hines, Ashanti Hamilton, Joe Davis, Nik Kovac, Robert Bauman, Jim Bohl, Milele Coggs, Willie Wade, Robert Donovan, Robert Puente, Michael Murphy, Joseph Dudzik, Jose Perez, Terry Witkowski, Tony Zielinski, Grant Langley, Martin Matson, Spencer Coggs, Ghassan Korban, and Jeffrey Polenske.